Hillary Angelo, an urban and environmental sociologist, was drawn to the campus and the department by the commitment to using research and teaching to inform activism and public policy. 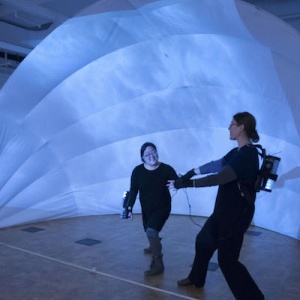 Katherine Isbister, right, conducts research at the intersection of human-computer interaction and games. UC Santa Cruz has 35 new senate faculty members joining this academic year, bringing the campus total up to 568. The new hires help to build campus strengths in many key areas across the divisions. One of those professors is Hillary Angelo, an urban and environmental sociologist who earned her Ph.D. from New York University. She was drawn to the campus and the department by the commitment to using research and teaching to inform activism and public policy. “This department is extremely focused on the world as it is and the world as it could be,” Angelo said. Her dissertation looked at the urban greening of Germany’s Ruhr Valley over the course of a century. 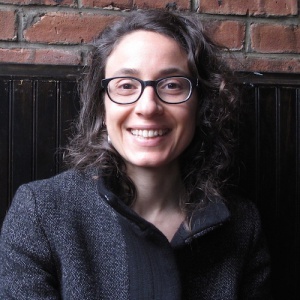 She’s now starting projects on equity and urban sustainability planning with a focus on New York and California, in collaboration with Miriam Greenberg, another faculty member in the Sociology Department. When people talk about sustainability, she said, it’s usually defined in terms of three areas: economy, ecology and equity. Planners can accomplish two of the three, with equity often getting left behind. Before enrolling in graduate school, Angelo spent five years working for the New York City Department of Parks and Recreation, primarily on issues of participatory design, immigration, and public space use. Katherine Isbister came to UC Santa Cruz to join some of the world’s top game engineering researchers working in the Baskin School of Engineering's Computational Media Department. Her research is at the intersection of human-computer interaction and games. She’s interested in how design choices and technological innovations impact how people feel and interact with each other, when they play games and engage other highly interactive systems. Isbister first discovered the power of games after the zoo where she worked after college installed an interactive kiosk. She wasn’t much of a bird fan, ignoring the birdhouse as she walked to her office, but the kiosk let the user try out being a redwing blackbird that needs to build a nest, attract a mate and find food. Below is a list of the senate faculty members who start within this academic year, as well as some of their research summaries. Alvaro’s research focuses on using data-centric languages and analysis techniques to build and reason about distributed systems, in order to make them scalable, predictable and robust to the failures and nondeterminism endemic to large-scale distribution. Angelo is a sociologist who uses visual, historical, and ethnographic methods to examine the interaction between ideas about nature and processes of urbanization. Her interests include urban greening, infrastructure, social theory, and the politics of urban sustainability in Germany and the United States. Bauerle’s current work is focused on the development of the online calculus course sequence for UC, in collaboration with a colleague in his department and UC Online Education. Beaumont’s research focuses on American constitutionalism as well as civic engagement and education. She is currently studying precursors to the U.S. civil rights movement and the tradition of civil disobedience. Breen is a historian who specializes in the globalization of medicine and the circulation of natural knowledge in the Portuguese, Spanish, and British empires. He is working on a book about the global drug trade in the seventeenth and eighteenth centuries. Brooks’s research group develops computational and high-throughput functional approaches to characterize somatic mutations in cancer genomes. Carpenter’s work is focused on the innate immune response to infection. Her research group is particularly interested in identifying novel regulators of gene expression programs following inflammation. Chen’s research focuses on studying economic and pollution impacts of regulation and emerging technologies on electricity, biofuel and transportation sectors as well as water resources. His work typically is policy relevant and has directly contributed to policy debates in California, the U.S. mid-Atlantic region and Europe. Fairbairn is an environmental sociologist whose research examines the political economy of land ownership and agricultural production. Fox’s research focuses on 19th century British and Irish literature, primarily on the relationship between gothic forms and the historical imagination between 1850 and 1900. Her book-in-progress, called “Necromantic Victorians,” investigates the reanimated body in late nineteenth-century literature, arguing that fiction and poetry with figures like the mummy, the galvanized corpse, or the speaking murder victim at their centers present the past not as a ghostly haunting but as a malleable object that can be brought to life at will, often with monstrous results. Friz works with and writes about transmission media and sound within the framework of critical theories of technology and object-oriented ontology. Her artistic practice currently includes field work with copper antennae and media artifacts in the sub-Arctic landscape of Iceland, compositions reflecting on the naturalization and pervasiveness of military practices into contemporary civil communications (such as the atomic clock), and explorations of electro-magnetic and physical urban infrastructure. Ginther is currently focusing on the relationship between voice, identity and power structures within actor training environments while incorporating and re-contextualizing interdisciplinary topics such as critical pedagogy, critical race theory, sociolinguistics, accents, dialects, adoption astudies, postcolonial theory, Shakespeare, standard language ideology, English as a foreign language (EFL), speech, singing, cultural studies, poetry, pronunciation, and intercultural theater. Hance’s research focus is in particle physics, using data from the Large Hadron Collider at CERN to search for new particles and forces at high energies. Heckman’s research concerns modern Jewish history in North Africa and the Middle East. She is interested in Jewish political participation and questions of activist citizenship in nationalist and internationalist contexts. Isbister is a human-computer interaction and game researcher with a focus on emotion and social connection — understanding the impact of design choices on these qualities, and innovating new methods for improving the experience of interactive technologies. Kiesling has been active leading youth orchestras throughout the country. Most recently, he spent five years as conductor of Gustavo Dudamel’s Youth Orchestra Los Angeles (YOLA) for the Los Angeles Philharmonic. Kiesling also continues as the music director of the Tulare County Symphony and enjoys a growing guest conducting schedule. Lazzati’s research areas are mainly economic theory and econometrics, including experimental economics. Her current projects provide microeconomic foundations for the empirical analysis of games. Lopez Vargas’s research fields are behavioral economics and experimental economics. In recent years, he has worked on risk attitudes and their interplay with fairness concerns; procurement and multiunit auctions; and communication in bargaining environments. Lyons´s research tracks human-soil relations across laboratories, greenhouses, forests and farms in the context of the U.S.-Colombia “War on Drugs”. She is interested in the transformative potential between science(s), ecology, and politics in the Global South, and feminist and decolonial science and technology studies. Murty studies popular narrative forms in post-liberalization India to analyze the ways in which political-economic policy acquires an emotive, affective public resonance. Through sculpture, writing, and public projects, Palmer’s current work considers and compares the deep times of geologic movements, the middle times of tiny organisms that bridge life and not-life, and the urgent (human) times of social and environmental justice, looking for models with which to imagine alternate futures. Robertson’s research focuses on topics in theoretical astrophysics, including galaxy formation, the nature of dark matter, hydrodynamics, and numerical simulation methodologies on new supercomputer architectures. Rolandi’s research focuses on bioelectronic devices, biological materials, and their translational applications. He is also interested in visual communication in science and engineering. Schneider is an anthropological archaeologist investigating the interactions between California Indians and colonial institutions. He is specifically interested in the practices of native people living beyond the walls of Spanish missions. Sgourakis’s research focuses on elucidating the structures of important protein complexes involved in Immune recognition of viruses, bacterial secretion and neurodegeneration. Skemer is an observational astronomer and instrument builder who specializes in directly imaging extrasolar planets. His work involves characterizing the atmospheres of known planets, and searching for new ones. To this end, I develop novel instrumentation and observational techniques to improve our ability to see very fainter planets near their bright host stars. Employing both quantitative and qualitative methods, Terriquez’s research focuses on social inequality, civic engagement, and youth transitions to adulthood. Much of her research has implications for policies affecting low-income, immigrant, and Latino communities. Velasco’s research focuses on the electrical properties of 2D materials at the nanoscale. These materials host novel physical phenomena that provide new insight on fundamental scientific questions, which can enable new technologies that may transform our everyday lives. Venturi’s research activity has been recently focused on developing new theoretical and computational methods (including the development of parallel scalable methods for high-performance computing) for stochastic analysis in large scale dynamical systems where geometry, initial conditions, boundary conditions, forces or physical parameters are set to be random. Zhang’s research is broadly aimed at climate systems on planets in our solar system and extra-solar planets. His group is developing a fundamental understanding of planetary climates from observational, theoretical and modeling work.